Is this not one of the prettiest lamps you have ever seen? This is a Himalayan salt lamp and I have been wanting one for years. This year for my birthday I was lucky enough to be given one from my bf (with some heavy hinting/directing). These lamps come in both pink and white salt rock/cyrstal, I love the pinky orange ones but it was a white one I had my heart set on. And I am over the moon with it. 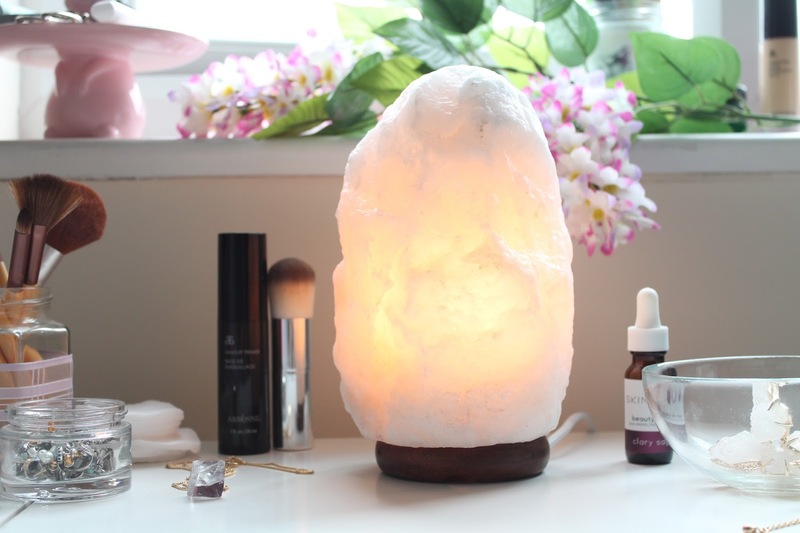 So why a Himalayan salt lamp? Well, there's a lot of research into the health benefits of salt lamps on the body and the mind and I am up for anything that can improve my environment and health in a natural and non-disruptive way. Now I like to think I'm quite open minded but at the same time I am quite a cynical person, I like 'facts' and 'science' and 'proof' while also believing that we can never know anything for certain (basically i'm just super confused and hedging my betts). So, I tend to take everything with a pinch of salt (pun totally intended). Here's some reasons why these lamps are thought to be so beneficial. In a hyper condensed and simplified nutshell the best way to explain it is that all the technology in out lives creates positive ions in our environment. This is called 'electromagnetic radiation' (EM radiation). EM radiation is known to cause stress, negativity effect sleep, lower the immune system, and increase static etc. Himalayan salt lamps have the opposite effect. They produce negative ions which neutralise the EM radiation. Thus improving your health and environment. 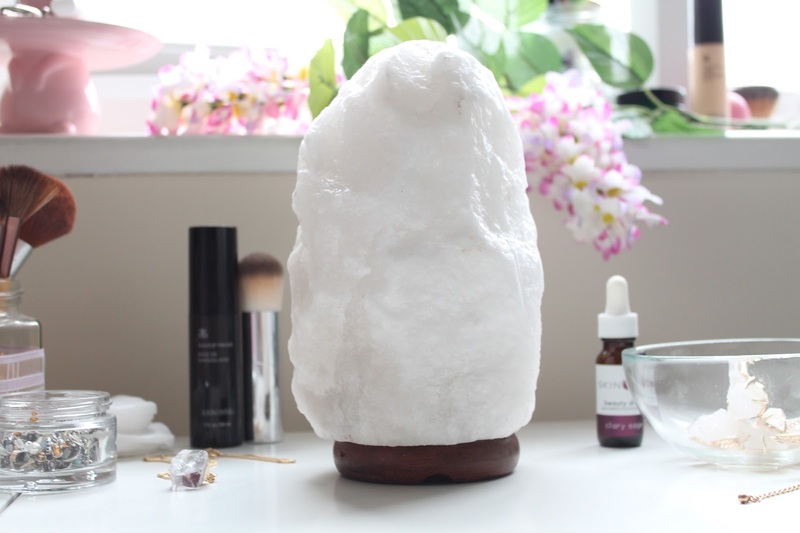 Not only do salt lamps cleanse the ions in the environment they are in, but they also cleanse the air. The lamps draw moisture (water molecules) from the air and locks it into the salt. Amongst the water molecules there are all sorts of other particles in the air such as dust, pollen and smoke etc. When the salt lamp draws in the water molecules it takes in these other particles too. The heat of the lamp then evaporates the water from the salt, but the particles are kept locked in the salt, so your air is cleansed and even deodorised. Clever no? This can really help with allergies and people who suffer with asthma. There are a whole bundle of other benefits (improved sleep, reduce coughs, treating SAD, improving energy etc etc) but I think these are the two most major ones for anyone to think about. This post deliberately only offers a snapshot into the benefits as it's best to do lots of research of your own and there are so many gazillions of articles out there that can explain everything (including the science stuff) in much clearer and better detail than me. As for me, I've been really enjoying having my lamp in my bedroom where I use my laptop and phone a lot. The soft glow is super calming and while i'll never have science to explore any personal changes to my life from the lamp, I feel great having it. Next up I want to expand my collection with a pink himalayan salt lamp and a few small tea light ones for other rooms in my flat. What are your thoughts on Himalayan salt lamps?